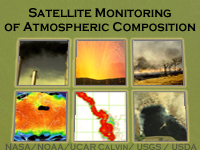 Satellite monitoring of atmospheric composition provides important information for a number of applications, including stratospheric ozone monitoring, long-range pollutant transport, biomass burning, air quality monitoring and forecasting, and climate change. This module provides an overview of the use of satellites in these application areas, the measurement techniques used, and the development of related operational services. In addition, the module covers a short history of European and U.S. satellite missions, as well as a look at future missions planned for monitoring atmospheric composition. Good information, but there is a lot of it. Pretty dry. The format of this course did very little to engage the user; the visuals did not change frequently and were not terribly engaging. It was difficult to focus, and incredibly difficult to understand what the purpose of the course was and what I was supposed to take away. I am not in the weather industry, I am in aviation, so it may be more engaging to someone with a direct application, but the little bits of information I wanted to get out of this were well hidden and I struggled to stay engaged with the course overall. I liked the use of examples from the past, including the one from July 22, 2011 for 8-hr max surface ozone predicted. Use of examples and case studies (like this) helps puts pictures along with the words that are spoken by the narrator and gives a clearer picture of what is being talked about. I found the information to be difficult to remember and it seemed as if the quiz questions were a bit different than that information provided within the lesson.